Yay! Part 3. I have yet to figure out where this story is going, but I’m excited to ride out the adventure. Naolin and I followed the setting sun, her tears falling to mark our path. As her tear drops reached the clouds they would turn white, grow wings, and fly off as doves. It gave a whole new meaning to “when doves cry.” When a demon cries, which is a very rare occasion, the tears are only red with blood. I know stories of vampires who cry tears of blood, well, they got that from demons. They are part demon after all, but that is a story for another time. I could sense Naolin’s fatigue. I pulled her towards the Earth, through the clouds, and landed in a forest so thick that only traces of light stole through the leaves. My feet touched the ground, but Naolin fell to her knees, her tears falling heavier. This time, her tears did not turn into doves, but made flowers grow where the sun would never reach them. The flowers were dark blue and no bigger than a dime. I had only seen the flowers in one other place, the fields of war, where the angels would cry over the short lives of good men. I could feel my own heart breaking as I watched a beautiful angel cry out her soul. “Naolin.” I said. I dropped to my own knees beside her and wrapped my arms around her. She didn’t fight it like I thought she would. She leaned into me, her body shaking from her sorrow. My heart beat quickly with joy that she would let me comfort her. I stroked her hair catching the scent of roses. I had always thought angels were lucky, sitting in heaven chatting and playing all day. Yet, here was this one angel in so much pain that everything I had known about heaven had to be a lie. I didn’t move or try to hurry her; I just let her cry until she could face the world again. I wondered how long she had held this in. How long had she tried to escape. All this time I had spent angry at the angels, and they were living in their own special hell. Naolin had grown silent. Actually, she had fallen asleep. Her steady, even breathing was pulling at every string in my heart. I brushed her black hair from her face and stared. She was breathtaking. Not like any angel I had imagined meeting. Her face was stained with tears and only now did I realize that her tears were silver. They caused her face to shimmer in the beam of moonlight we sat in. Her lips were thin, her bottom lip fuller than her top lip. I wanted nothing more than to see what her lips felt like against mine, or even just against my fingers. Hours had passed before Naolin stirred from her sleep. She had mumbled a few times, but nothing was coherent, it made no sense. Once I heard my own name pass her lips in her sleep. I had smiled at first, then worried that she was possibly killing me in her dreams. Yes, a demon can be killed. We will never enter heaven though. There is another place in hell for demons that have been killed. It’s below the deepest depths of human hell. Demons are not bad, not all of us, but because of the few bad ones we all must suffer the same fate in death. “I am sorry.” Naolin said. She stood quickly and brushed off her pants and tugged her shirt straight. She wore such simple clothing for such a beautiful woman. “What is there to be sorry about?” I asked her as I stood and brushed my own clothes off. I looked at her and watched as she took a step back. Putting more distance between the two of us. I could feel the dagger in my heart. Not only moments ago she felt safe enough in my arms to sleep and now she was pushing me away. 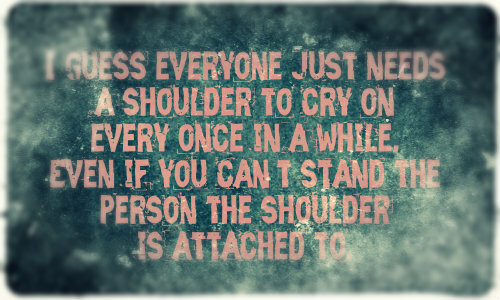 I guess everyone just needs a shoulder to cry on every once in a while. Even if you can’t stand the person the shoulder is attached to. “I shouldn’t have lost myself in my own misery. We both have work to do and I have wasted our time.” She turned to walk away. “Really? That again?” I dropped her hand and turned my back to her. “My name is Kyson, in case you forgot.” I turned around with my arms crossed at my chest. “Also, I just helped you escape heaven again.” I glared at her, waiting. “And then watched over you while you cried and fell asleep.” I tried to keep my voice soft, but anger was seeping into my words. “I didn’t ask you to do that.” She said. Her voice was so low I almost didn’t hear her. “But I did it because demons are not what you think we are.” I uncrossed my arms and shoved my hands in my pockets. “That is not what we have been told in heaven.” She looked at me, her eyes were almost teal and the whites of her eyes still red from crying. “Well you have been misinformed. Just as the demons have thought wrong all these years. Do you know that demons have hated angels for years now?” She was staring at me, one eye brow raised. “Yeah, we hate angels. We thought you were all sitting in heaven, laughing while demons did all the work. Then, we do all this work for nothing. We can never get into heaven, yet we are doing all of heavens work.” I took a deep breath and looked up at the tree tops. “There is nothing you can do.” She dropped her hand and lowered her head.